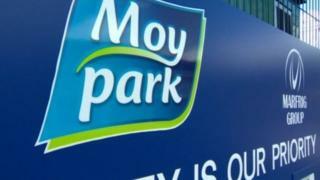 The poultry firm, Moy Park, is to temporarily halt some production at its factory in Ballymena, County Antrim. It will stop slaughtering birds at the factory until January next year and its north Antrim hatchery will also be out of operation until November this year. The company has said it "does not anticipate any job losses" due to the move. However, the union representing workers disputes this, saying the news could "result in up to 400 job losses". The company said the decision to stop some production had been taken due to "challenging market conditions". Processing and packing operations will continue at the Ballymena plant. The firm said the impact on jobs is expected to be minimal and said it would offer temporary transfers to other shifts and roles. However, Sean McKeever of the union Unite, said he was "highly concerned" with the news of the temporary closure. He added: " Our members on the shop-floor are reporting that they have been told that this will result in up to 400 job losses although the company are telling the media that there will be no job losses and that redundancies can be avoided through redeployment elsewhere. "Unite is the only trade union on the ground in North Antrim and we do not accept the need or case for any job losses in Ballymena or anywhere else in Northern Ireland". Moy Park said it will also be "working closely with farming partners throughout the process to manage this temporary reduction in poultry requirement". The firm is one of Northern Ireland's largest private sector employers: About 1,700 people work at the Ballymena plant with about 3,500 more at other Northern Ireland operations. The business is owned by US-based Pilgrim's Pride. It is understood that poultry farms which supply Moy Park will face reduced demand for their birds during the production stoppage. The UK poultry industry is intensively competitive with major supermarket contracts having a particular impact on processors.